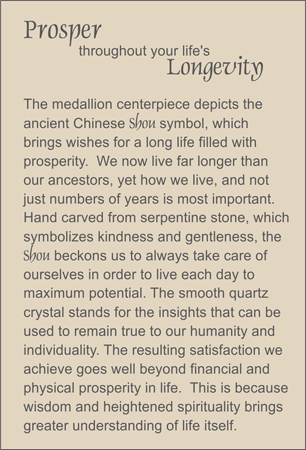 Longevity is the sentiment behind this necklace which features a natural serpentine hand carved medallion depicting the ancient Chinese Shou symbol for long life and prosperity. Eternal knot medallions in poppy and taupe-colored serpentine and hand carved bone are presented in the body of the necklace to point out the essential role of loving relationship in achieving longevity. Trios of carnelian ellipses and bronze-colored seed pearls complete the design. Sterling silver toggle clasp.